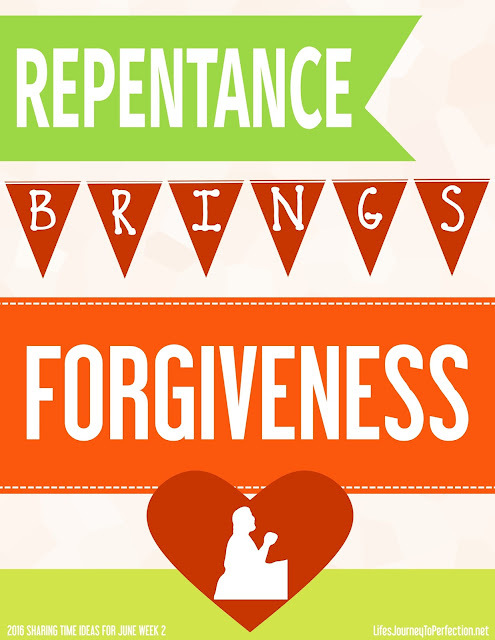 Life's Journey To Perfection: 2016 LDS Sharing Time Ideas for June Week 2: Repentance brings forgiveness. Hey friends! Welcome to some ideas for June Week 2 Sharing Time. Follow me on Instagram for more fun inspirations, I am @lifesjourneytoperfection there. 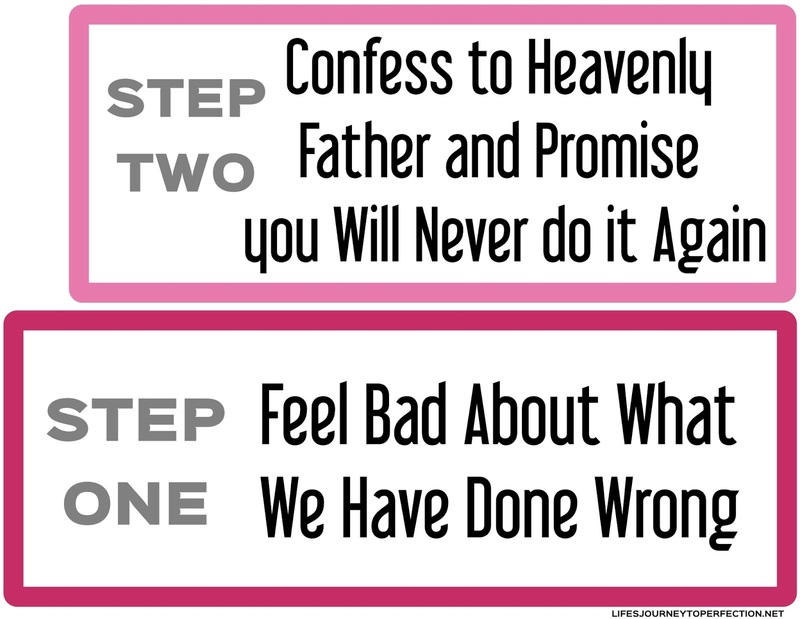 June Week 2 Topic: Repentance brings forgiveness. Place the Week's theme poster on the board, but have the word "Forgiveness" covered up. Invite the primary children to read "Repentance Brings..." Ask the primary children what they think the final word is, What does Repentance bring? Thank the primary children for their answers. Invite the primary children to find the following scripture, D&C 58:42-43. When they are all their invite one of the primary children to read it. Then ask them the question again, What does Repentance Bring? The answer, Forgiveness! Take the paper off of the word "Forgiveness". Review with the children the steps of Repentance. 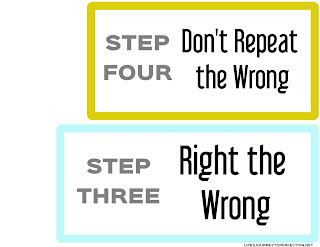 You could use the printable steps in the free download. At the top of the steps place the poster that says Forgiveness. Ask the Primary children what Forgiveness is. Either on a board or a white board write some things like, "Told a Lie", "Hit my brother", "Disobeyed my Parents", "Said a Bad Word", etc. 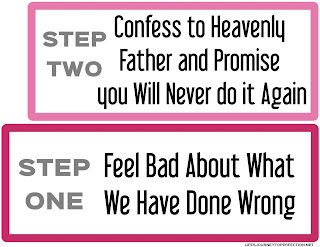 Explain that as we follow the steps of repentance, the atonement comes and wipes away the sins and they are remembered no more. Our Heavenly Forgives us of them. 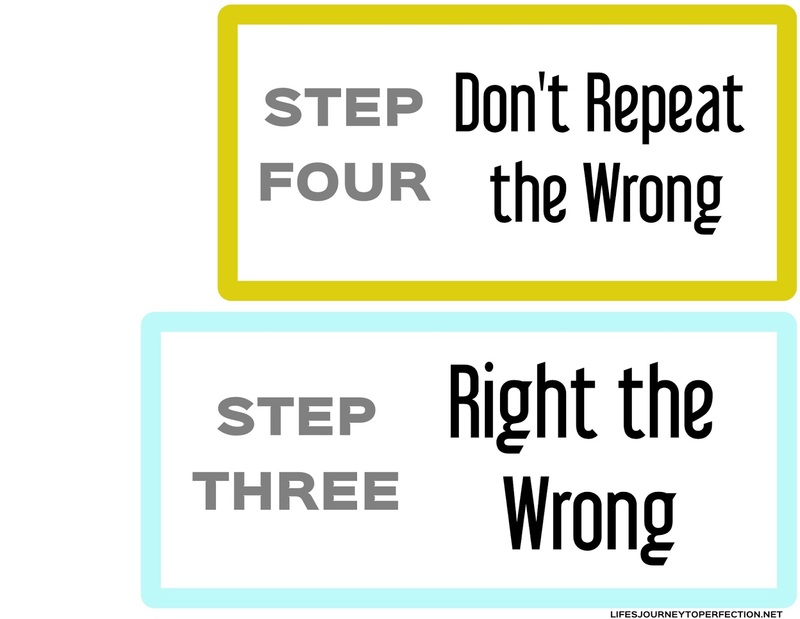 Invite the primary to repeat the week's theme, "Repentance brings forgiveness". 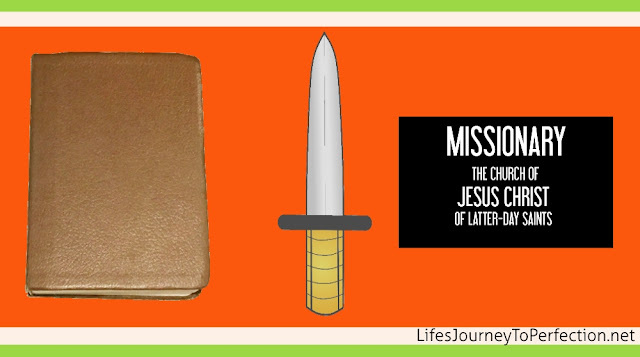 Place the following items on the board or on a table: Scriptures, Missionary Tag, a Paper Sword (see printable in the free download) Explain that you are going to tell them three stories and you would like them to choose which of the items, represent that story. Invite a primary child to come up and hold the picture. You could either read the scripture or summarize it. If summarizing it could go something like this, "Abinadi came and prophesied to King Noah, teaching the ten commandments. The king was not happy and commanded that Abinadi be slain. In the crowd was a young man named Alma who believed all that Abinadi had said and he went and pled with the king to not be angry with Abinadi. This made the king very mad and he sent his servants to kill Alma. Alma left and hid, he wrote down all the words that Abinadi had taught. He repented of his sins and he went and began to teach the words that Abinadi had taught. It says, "And as many as would hear his word he did teach. And he taught them privately, that it might not come to the knowledge of the king. And many did believe his words." (Mosiah 18:3) Many gathered near the waters of Mormon to hear his words, everyone that went to listen to him were baptized. He baptized around two hundred and four people." Ask the primary children which item would represent this story? Place the picture of Alma on the board and next to it place the scriptures (if they are real scriptures they will need to be placed on the chalk board ledge, under the picture) Ask the Primary children how we can follow the example of Alma? Discussion could include that we can continually repent of our own sins and share the gospel to all those around us who will hear. If summarizing: "Jonah was commanded by the Lord to go to a wicked city Nineveh. He was to cry repentance unto the city. But Jonah decided he was going to try to flee from the Lord and found a ship that was going to Tarshish and got on it. As the ship sailed the Lord sent great winds upon the sea, so great they were going to wreck the ship. All of the men on the ship were afraid, Jonah ended up telling them that it was his fault there was a great storm and that if they threw him into the sea it would stop. So they did so and the storm stopped. The Lord caused that a great fish would swallow up Jonah and he was in the fishes belly for three days and three nights. Jonah prayed for forgiveness while in the fishes belly. The Lord heard his cries and spoke to the fish and the fish spat him out onto dry land. The Lord than said to him, "Arise, go unto Nineveh, that great city, and preach unto it the preaching that I bid thee." (Jonah 3:2) Jonah then went and preached to the city of Nineveh. They believed and proclaimed a great fast and repented. Ask the primary children which item could represent the story of Jonah? Explain that Jonah was a missionary who was called to teach repentance to the people of Nineveh. Because he ended up going and preaching to them, their city was saved from destruction. 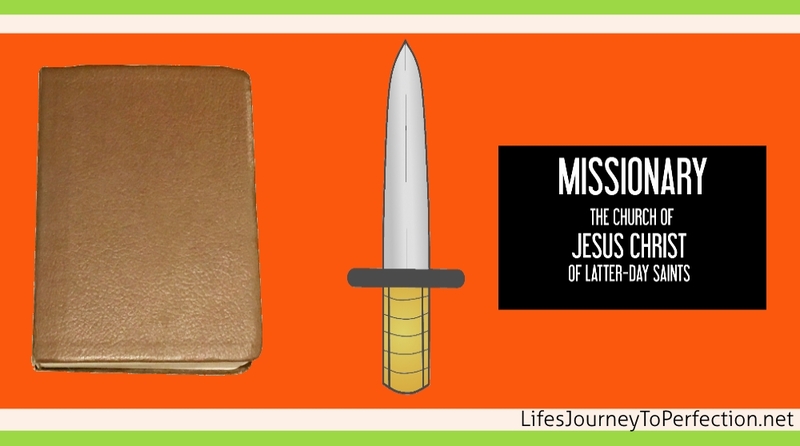 Ask the primary children how they can be missionaries? If summarizing: "Ammon and his brethren went among the Lamanites teaching them the records and prophesies. Many believed and they became a righteous people. They laid down their weapons, they repented and buried their weapons in the earth. Making a covenant with God, "that rather than shed the blood of their brethren they would give up their own lives; and rather than take away from a brother they would give unto him; and rather than spend their days in idleness they would labor abundantly with their hands." 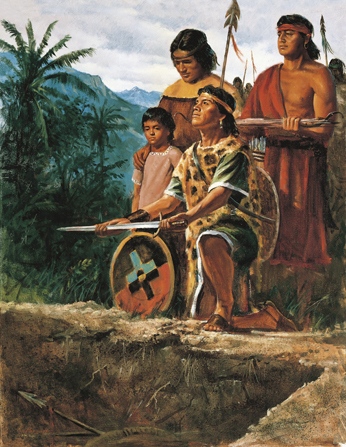 (Alma 24:18) They were called the Anti-Nephi-Lehies. 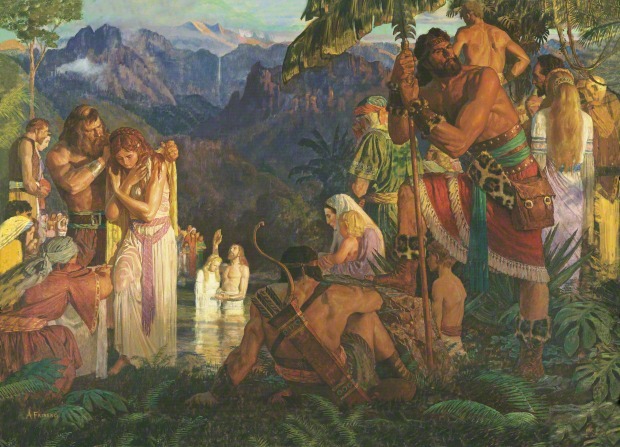 Ask the primary children which item could represent the Anti-Nephi-Lehies story? Explain that these people repented and made a covenant with Heavenly Father, burying their weapons and promising to not fight against God's cause, nor their brethren. Ask the primary children how they could like the Anti-Nephi-Lehies live their lives in righteousness, devoted to Heavenly Father's desires? To close share your testimony that as we repent and turn away from sin our Heavenly Father will forgive us of our wrongs and will remember them no more. I love the way scripture stories help us make real connections to our lives. Thanks for the printables! We're already planning for June?!?!?! hahaha, I still need to get on the ball for May! Love these ideas though. I'm still trying to decide which song I'll teach in June. :) Which song did you decide on Amberly? I love the story of Ammon! It's perfect for this lesson! It is isn't it :) Thanks Heather! Thank you for your creative ideas that teach the gospel. I used your June Week 1 ideas today in Sharing Time. I feel it went well. I look forward to using your Week 2 next Sunday. Thanks for the amazing downloads and simplifying the ideas. It was most helpful.